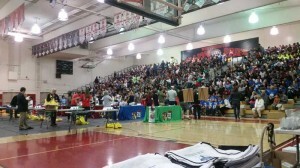 Math Contestants from all over OC flocked to the annual OC Math Field Day event last weekend on May 16, 2015! 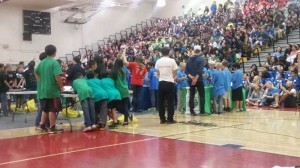 This day of exciting competitions, held on the campus of Westminster High School, allowed fourth to sixth grade students who had been selected by their schools to compete head-to-head in different categories related to mathematics. 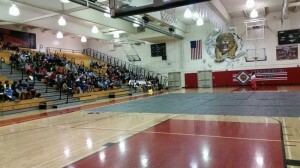 Each school invited around 12 students per grade level to represent their school. Our educational outreach crew at Areteem Institute joined in on the fun to experience all that the day had to offer! Our booth was centrally located where all of the parents and teachers set up their tents and provided much needed treats and refreshment to the hungry contestants between competitions. We were also able to view all of the great posters that each school had contributed, relating to this year’s theme of “Livin’ the Math Dream in 2015”. 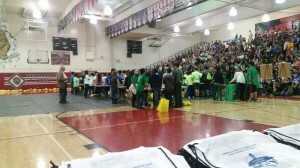 Students who visited our booth in the morning were delighted by the unique hands-on STEM projects that we brought to the event based on our “Carnival of STEAM-antics” that was a hit at this year’s LA County Science and Engineering Fair! In the afternoon we moved indoors to the campus gym and took part in the event known as the “Rubik’s Cube Challenge”. A handful of schools participated where they had to quickly solve the puzzling Rubik’s Cube in the fastest amount of time…and believe us those fingers were flying! The event closed with the Awards Ceremony where we had the privilege of awarding medals to all of the winners. School teams were awarded from sixth place to first place based on the categories involved in the competition which included: Algebraic Thinking, Number Operations, Data Analysis, Geometry and Measurement. At the end of the day, every student received a goodie bag from us to take home, what a day! It was a great opportunity to network with OC parents and educators and we thank the Orange County Math Council for having us sponsor the event for another year in a row! Take a look at our photo gallery to see all that went down!